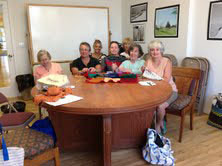 The Knitting Circle meets every Monday at 1 p.m. It is a chance for members to share yarn, patterns and ideas with fellow knitters. The group works on individual projects and also makes special items for donation to charity. Knitted baby garments are donated to hospitals and outreach programs for new mothers; lap blankets are given to nursing and rehab facilities. Contributions of yarn for these special projects are appreciated. New members are always welcome. For information on the Knitting Circle call Caroline Hendrickson at 725-0049.